The pizza will be set up on a large cutting board. You will be given 1 pizza cutter and are allowed to make 3 cuts in total. You are allowed to set it up how you please before and after each cut. Your friends are really hungry and will always try to take as much pizza as possible. What is the maximum amount of pizza you can get if you follow these rules? If you are still restricted to 3 cuts, but you are allowed to distribute the pizza however you please (as long as your friends always have equal or more than you) how can you cut and distribute the pizza such that you all get even portions (The max as possible for you)? Edit If you can't do the center 60° cut, just use parallel cuts to cut into 3rd, then a perpendicular cut to get 6ths again. The parallel cuts have an arc of 2.605 rads, or about .267 radius from the center. 6 friends: Cut out a triangle from the middle, total of 7 pieces, max. tada! The pizza is all mine now! Scrape all of the toppings into a bowl. Cut pizza in half, let them take the 2 pieces. Cook noodles, dump topping in noodles, enjoy. Given that the friends will always take the biggest pieces and more pieces, if the number of pieces is not divisible by three, the absolute most you can get is one third (1/3) of the pizza. Rotate the lower half 180 degrees. 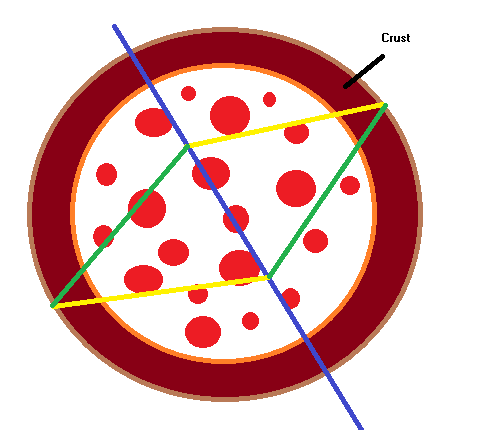 Make a cut from the top of the pizza, exactly 60 degrees along the (now half-circle double-layered) pizza, down through the center point of the pizzas horisontal line. Repeat 4, but with 120 degrees. Voila, 6 equally sized slices. Pretend the picture is to proportion. Thus, you approximate $A$ to be $\frac13$ of the pizza, $B$ to be the same (except going upwards), and $C$ to overlap $A$ (technically having 3 cuts, though only $2$ legit cuts). Thus, three slices of equal proportion are left. Alternatively, you could split the pizza into six equal slices. The first scenario would work with your "restriction." 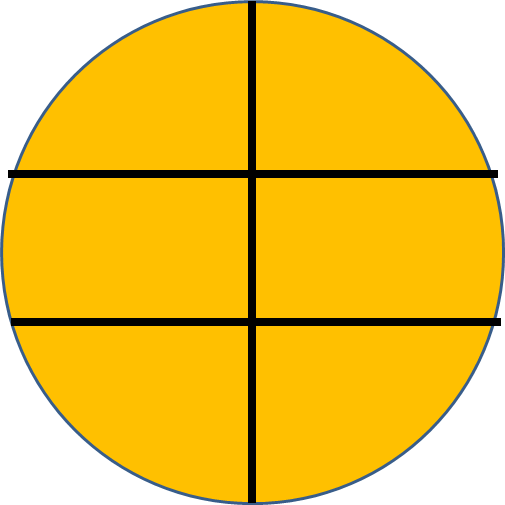 Cut one line horizontally through the center. Then make two more cuts vertically, such that all three pieces above (or below) the original cut have equal area. Update: Per the comment: the vertical cuts should go through points about 15 degrees from the center. This would be a smidge over 1/4 radius. 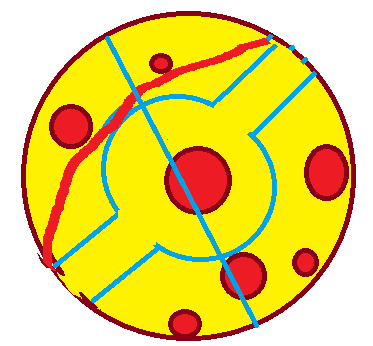 Thus, the central pieces would be about 1/2 radius wide, and the others would be 3/4 radius wide.